San Diego’s new Church of Scientology opened Saturday, November 19 in the city’s downtown. Some 3,500 Scientologists and guests were on hand to witness the historic occasion. The crowd erupted in cheers as Mr. Miscavige took the stage for the grand opening ceremony on Fourth Avenue in San Diego’s downtown corridor. On a sunbaked San Diego afternoon, 3,500 Scientologists and guests celebrated the inauguration of the city’s new Church of Scientology. Mr. David Miscavige, Chairman of the Board Religious Technology Center, led the dedication of the Church of Scientology of San Diego, Saturday, November 19. 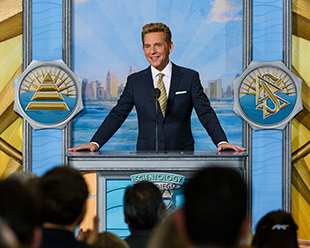 Mr. David Miscavige, the ecclesiastical leader of the Scientology religion, addressed the thousands present during the inauguration ceremony. The San Diego grand opening punctuates an explosive era of expansion for the Church and marks the 55th Ideal Church Organization to open its doors. Ideal Orgs now stand in cities all over the world—from Los Angeles to London, Melbourne to Milan and Tel Aviv to Tokyo. Joined by prominent Scientologists of San Diego, Mr. Miscavige officially dedicated San Diego’s Ideal Church of Scientology. Thousands of Scientologists and their guests congregated in the city’s downtown core to witness the festive ribbon cutting on Saturday, November 19. The Church of Scientology of San Diego was inaugurated November 19, 2016 before an audience buzzing with excitement in recognition of their milestone achievement. From the first strains of a mariachi band mixed with the uplifting tones of the Beach Boys’ “Surfin’ USA,” the scene was set for a spectacular grand opening celebration. Mr. David Miscavige with (left to right): Dr. Beatriz Villarreal, Education Advisor to the County of San Diego; Mr. John Redman, Director of the High Intensity Drug Trafficking Areas program (HIDTA); Ms. Estela De Los Rios, member of the National Steering Committee for Human Trafficking; and Colonel Bart Billings Ret., National Guard Medical Directorate. Attendees toured the new facility, eager to see every detail of their new home. Once the ribbon was cut, thousands poured through the new San Diego Church taking in the facilities where they will advance through Scientology services. The new San Diego Church stands on the downtown corridor of Fourth Avenue, just blocks from City Hall. Located in the thriving urban core, the 49,000-square-foot facility welcomes all from San Diego and beyond. The San Diego Church of Scientology not only provides the facilities to service Scientologists in their ascent to higher states of spiritual freedom; it is also a meeting ground for cooperative efforts to serve people of all faiths. RECEPTION Open seven days a week, morning to night, the Church of Scientology of San Diego Reception welcomes anyone wishing to obtain an introduction to Dianetics and Scientology. SCIENTOLOGY PUBLIC INFORMATION CENTER The Public Information Center offers some 500 films, providing a complete introduction to every aspect of Dianetics and Scientology. It includes the beliefs and practices of the religion as well as the many humanitarian initiatives and community outreach programs the Church supports. INTRODUCTORY SERVICES The Church of Scientology of San Diego provides for the delivery of all Introductory Services. These include evening and weekend Dianetics and Scientology seminars imparting an overview of the fundamental principles and their application for living. DIANETICS & SCIENTOLOGY BOOKSTORE The Church of Scientology of San Diego Bookstore makes available L. Ron Hubbard’s works on Dianetics and Scientology. In all, Mr. Hubbard’s legacy spans tens of millions of published words in dozens of books and thousands of recorded lectures. Materials are available in 50 languages. THE PURIFICATION CENTER Scientology Founder L. Ron Hubbard developed the Purification Program to free individuals from the mental and spiritual damage caused by drugs and toxins, through a regimen of exercise, sauna and nutrition—all of which are provided for in our Purification Center. Scientology auditing (spiritual counseling) is delivered in an array of auditing rooms, providing the ideal, distraction-free environment in which to achieve spiritual enlightenment. THE ACADEMY The Academy is where Scientologists train to become auditors (spiritual counselors), capable of applying the technology of auditing to help others attain spiritual freedom. The San Diego Academy comprises multiple course rooms, each devoted to a different aspect of training. The fourth-floor Terrace, with its expansive view of downtown San Diego, serves as a gathering place in the spirit of a Scientology Ideal Organization: a home to both Scientologists and the greater community alike. THE CHAPEL Scientology services and ceremonies are convened in the Chapel, including Sunday Services open to members of all denominations. It further serves as an ideal venue for workshops, banquets and events in the name of community collaboration for the betterment of San Diego. THE OFFICE OF L. RON HUBBARD As is tradition, the Office of L. Ron Hubbard stands in honor of the religion’s Founder and symbolizes that this Ideal Organization is true to his writings and ideals. Inauguration of Ideal Church hailed as moment for the American Dream in city Scientology Founder L. Ron Hubbard called home. Follow the Pacific Coast Highway down Southern California’s meandering shoreline along a 70-mile stretch of sandy beaches basking in the most perfect weather—anywhere—and you’ll arrive to the city of San Diego. Such was the location for a sunbaked Saturday afternoon amid San Diego’s downtown skyline—a sublime setting to celebrate the city’s new Church of Scientology. The San Diego grand opening punctuates an explosive era of expansion for the Church and marks the 55th Ideal Church Organization (Ideal Org) to open its doors. Ideal Orgs now stand in cities all over the world—from Los Angeles to London, Melbourne to Milan and Tel Aviv to Tokyo. “Ideal” is the standard set by Scientology Founder L. Ron Hubbard so that every Church could be a perfect expression of the religion’s principles and practices. So it was on Saturday, November 19, some 3,500 Scientologists and their guests were on hand to witness San Diego’s historic grand opening. And from the first strains of a mariachi band mixed with the uplifting tones of the Beach Boys’ “Surfin’ USA,” to dignitaries representing every political and social spectrum of San Diego City and County—the inauguration positively embodied the city’s rich culture. The ceremony also paid tribute to the exceptional place San Diego holds in the life of L. Ron Hubbard (LRH). For it is a city where he not only lived during his youth, but later launched a legendary writing career spanning half a century and placing him among the most enduring and widely read authors of all time. Presenting a sense of just what that humanitarian commitment contains were San Diego dignitaries on hand to welcome the Church: Mr. John Redman, Director of the High Intensity Drug Trafficking Areas program (HIDTA); Dr. Beatriz Villarreal, Education Advisor to the County of San Diego; Ms. Estela De Los Rios, member of the National Steering Committee for Human Trafficking; and Col. Bart Billings Ret., National Guard Medical Directorate. The new San Diego Church provides visitors with an introduction to Dianetics and Scientology, beginning with the Public Information Center. Its displays, containing more than 500 films, present the beliefs and practices of the Scientology religion and the life and legacy of Founder L. Ron Hubbard. The Information Center also offers a detailed overview of the many Scientology-supported humanitarian programs. These include a worldwide human rights education initiative; a far-reaching drug education, prevention and rehabilitation program; a global network of literacy and learning centers; and the Scientology Volunteer Minister program, now representing the world’s largest independent relief force. San Diego’s Ideal Organization also features a Chapel that provides for Scientology congregational gatherings, including Sunday Services, weddings and naming ceremonies, as well as a host of community-wide events open to members of all denominations. The facility further includes multiple seminar rooms and classrooms, in addition to an entire floor dedicated to Scientology auditing (spiritual counseling). The San Diego opening caps a year of expansion for the Church. Recent Church openings have occurred in Sydney, Australia; Harlem, New York; Budapest, Hungary; Atlanta, Georgia; Milan, Italy; Tokyo, Japan; Bogotá, Colombia; and Basel, Switzerland. Also, this summer the Church opened Scientology Media Productions, a five-acre, technologically cutting-edge studio in Hollywood, California, in which the religion’s message will be proclaimed via television and radio broadcasting, Internet and social media and every other media platform. And more is on the way, with openings of Ideal Organizations in 2017 planned for global cities and cultural capitals in North America, South America, Europe, Africa and Australasia.